Dr. Alfred B (C) Davis was a physician. According to the A.M.A's Obituaries of Deceased Doctors, he died before 12/31/1929 (the date of printing). He was an Allopath. He practiced a form of medicine where the doctor tried to heal the patient by doing or causing the opposite of the disease's symptoms. He attended, the Hospital College of Medicine in Louisville and graduated from the Central University of Kentucky in 1887. These schools were not anything like modern medical schools. Usually the student only attend one to three classes for one to three terms. Sometimes they were not required to attend at all but rather sent a letter stating their present practice and a fee. Usually the student practiced under the supervision of a practicing physician for one to three years and was then declared a doctor. His apprenticeship most likely took place in Kentucky as there was a family member listed nearby who was a practicing Physician. Since neither of these schools can be traced today his training has to be guessed at. Doctor Davis is mentioned in The History of Bell County, by George W. Tyler,p.230, and p.236. The first passage describes his being appointed as a member of the, Commissary Beat to care for the families of Confederate soldiers absent due to the war. The second passage describes him as being exempted form military duty due to his being needed by the people of the county. Doctor Davis is also mention in, Bell County Revisited, by Martha Bowmer, p.262. This passage describes the construction of the first brick buildings in Holland, Texas shortly after a fire in 1887. His home was one of these brick buildings. 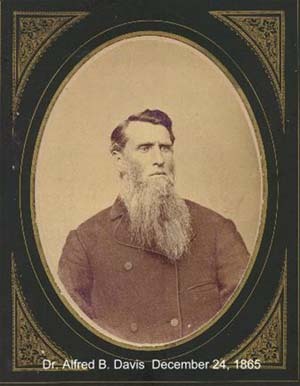 In spite of the reference in The History of Bell County, by George W. Tyler (above) of his having been exempted from military service it appears that he served, at least briefly, in the the 16th Texas Cavalry (Confederate) during the Civil War. There is a record in the National Archives consisting of two reference cards showing that he enlisted in Co. K, 16th Texas Cavalry (Fitzhugh's Regiment, 3 Reg't. Johnson's Brig.). These cards show that a man, almost surely this man due to age and place of enlistment, named Alfred B. Davis, enlisted at McKinney, TX on March 10th, 1962 for a period of one year. The cards show that he was appointed Sargeant Major of Co.K. He is also show as being in possession of a personally owned horse valued at $160 and horse gear valued at $35. Assuming that this is my A.B. Davis, MD it appears from other rosters that no positions existed for a "Surgeon" or "Surgeon's Assistant" at the time of his enlistment. This could explain why a physician joined as an enlisted man. Furthermore, his appointment ON ENLISTMENT DAY as a Sgt. Major, the highest enlisted rank, can be explained by his being a physician in civilian life and no opening existing at the time of his enlistment. The history of the 16th Texas Cavalry shows that the unit was formed in Dallas TX and assigned to the Dept of Texas and later the Eastern District of Texas, Trans Mississippi Department. Which meant that they were eventually envolved in the battles over the control of the Mississippis River including but not limited to the Battle of Vicksburg an surrounding area. Based on the day of the battle and Dr. Davis's dates of service it is highly likely he was involved in the Battle of Hill's Plantation (Round Hill Plantation on the Cache River) in Arkansas on 7 July 1862. It appears, due to the lack of his name on subsequent muster rolls, that when his enlistment ended he returned to Bell County TX and that he was exempted from further military service, as stated in the book listed above, due to the need of his services on the home front. Birth: Kentucky Teater Family, H. Glenn Teater, et al. Marriage: The Reynolds Family of Jessamine Co. KY, by Emalene Reynolds Rohrer. p.28. Census: 1850 Garrard Co. Ky p.280A (or 179) FHL: 442969: Alford Davis 27 farmer, Elizabeth A. 24, Sophrona 5, Elizabeth 3, also Catharine Holms 25 F $500 Re b. KY.
Also: many records of Davis and Teaters families came from the collection of, E. Harlow; 340 S. 100 E.; Brigham City, UT 84302-2604. Records on file at the National Archives in Washington D.C .